Join SA Greys at this mega-adoption event at the Tucson EXPO Center, April 13th. 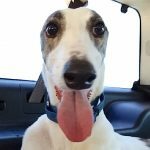 SA Greys welcomes three new hounds from Hemopet in California. Linkin is asking for your help with recent medical bills. Meet Petunia! She is as pretty as a petunia with her white coat and splashes of brindle over her two eyes, on her body and one on her head between her ears that is a little kiss of brindle. Petunia is an easy going hound who is quite calm, rides well in the car and walks on her leash with no problems. She also does well when meeting new people. When you let her out in the yard though she just loves to run and play and have fun! 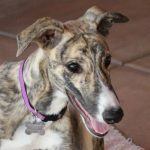 SA Greys is a Tucson-based, all-volunteer, 501(c)(3) non-profit organization dedicated to finding loving forever homes for retired racing greyhounds in Southern Arizona. Since our incorporation in 2012, we have placed over 500 greyhounds in loving and qualified forever homes. 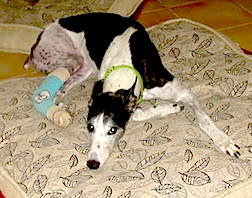 Our greatest accomplishment has been to rehabilitate injured or ill greyhounds. We have taken in many hounds who suffered career ending injuries or illnesses that required exceptional veterinary care. These hounds now enjoy retirement in their forever homes, just like the hound on your couch and in your heart. Special needs dogs are helped by Jackie's Fund, a fund started when Jackie, our original poster dog, required costly veterinary expenses. Transforming retired racers, especially those who are injured or ill, into "couch potatoes" takes dedicated volunteers and resources. Since or founding, we have incurred nearly a $1,000,000 in expenses for veterinary care, treatment, and housing. It is worth it every time we place a happy, healthy greyhound in a forever home. Please join us in supporting the hounds in any way you can. Thinking about adoption? You're at the right place! We work with farms and tracks nationwide to bring in retired racers. We're dedicated to finding loving forever homes for these deserving hounds. Prior to adoption, they are spayed/neutered and tested for cat tolerance. Dogs spend a few weeks with trained volunteers to learn the ropes of home living and living with their new families. Every dog in foster care is one step closer to our goal of a loving forever home. Our objective is to help the dog become acquainted with family living. Your foster greyhound will experience many firsts – to walk on tile or stairs, to watch TV, to be in a house, to be with other dog breeds, cats, and perhaps children. You will guide and correct behaviors as their foster parent. SA Greys is a dedicated group of veteran greyhound adopters and volunteers, who are committed to seeking the very best lives for the greyhounds in our care. 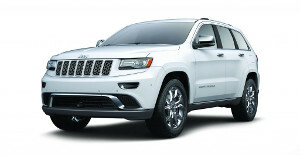 Located in the greater Tucson area, we service most of Southern Arizona. SA Greys is non-profit and entirely volunteer run, so we are able to squeeze every dollar for the care and promotion of this special and wondrous breed.